When the city of Madras envisioned an expanded Sahalee Park back in 2005, changes such as a new pavilion, a pioneer memorial, and realigned parking were all on their agenda, and soon accomplished. 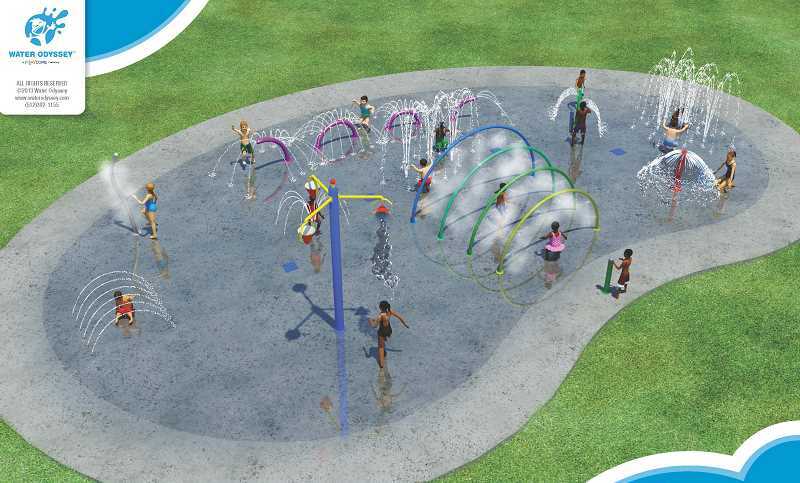 On Monday, another key feature of the 2005 plans — a spray park — moved one step closer to reality, when the city finally moved forward on its long-awaited project. 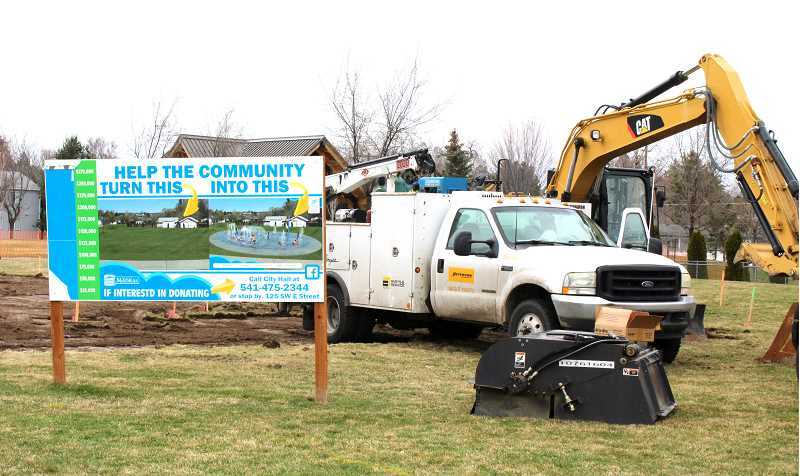 DSL Construction broke ground on the $550,000 project April 1, and should have the project complete in time for the city's Fourth of July celebration. Fundraising for the project began in earnest in March 2016, when the Bean Foundation, along with KEITH Manufacturing, met with city and offered funds to get the process started. Each contributed $45,000, and the Madras Redevelopment Commission, another $10,000, toward the initial estimate of $275,000 the total to $100,000 by June 2017. A year ago, with matching funds in place, the city went to Salem to present a grant proposal to the Oregon Parks and Recreation Department. The OPRD committee suggested that rather than retrofitting the city's stormwater pipes to accept the water from the spray park, the city should add a cistern and other improvements. OPRD offered additional funding to install a 20,000-gallon cistern, redo ramps to the restroom to make them ADA-accessible, and add a sidewalk to the spray park to ensure that anyone with disabilities is able to use the park. At that point, the cost was estimated at $500,000, and OPRD offered grant funding if the city could come up with half. Even with the $550,00 total, the city now has the funding, thanks to a long list of donors, including the Bean Foundation, KEITH Manufacturing, Bright Wood, Wilbur Ellis, MRC, Central Oregon Seed, Deschutes Basin Farms, Greh Fab, Daimler Trucks North America, TSS Subaru of Bend, and Oregon Embroidery. "The park will have an entrance archway that states 'Ethan Stovall Spray Park,' and underneath it will state 'Dedicated to all of those lost too Young,'" said Hurd. Ethan Stovall, the son of Cameron and Jennifer Stovall, died at age 4 months. "The idea is to not only dedicate it after Ethan, but to dedicate it for all children that were lost at a young age," said Hurd, "to honor all of those kids." Hurd expects the final cost of the park to be in the range of $550,000-$580,000. "We're still working on defining the bathroom remodel to get exact numbers," he said.